Saturn V Third Stage (S-IVB) Oxidizer (LOX) shutoff Prevalve manufactured by SNAP-TITE Inc (AERVALCO division) under subcontract to Douglas Aircraft Corp, prime contractor assigned to design/build the S-IVB. This 10 inch diameter inlet/8 inch outlet butterfly valve is one of two installed on the stage. The fuel prevalve is mounted to the tank integral elbow on the fuel duct (actually mounted on the OML of the vehicle). The LOX prevalve is mounted directly to the LOX tank sump and is located 'under' the thrust structure. The valve disk is actuated by a pneumatic piston (using helium supplied by the stage He control bottle) with a response time of 315 milliseconds. When fully opened, the valve facilitated a LOX flow rate of 386 pounds per second at 60 PSI. An integral relief valve supported propellant bleed off and back flow to the propellant tank when the Prevalve was closed to inhibit rupturing of the main propellant duct section. The Prevalve is normally open during LOX (and LH2) tank filling to allow all feed ducts and engine plumbing (upstream of the main engine propellant valves) to fill with cryogenic propellants resulting in feedsystem chilldown so that the Oxidizer (and Fuel) will remain in liquid form. The valve is also opened in conjunction with powered flight operations. The Prevalves are closed approximately five minutes before liftoff of the Saturn V (10 minutes preceding liftoff of the Saturn IB) up to the point in the flight until just before J-2 engine start to isolate the propellant tanks and permit the propellant to flow via an alternate path in support of the recirculation chilldown system (this system uses the cryogenic propellant to condition the ducting and engine to the proper temperature level and to eliminate bubbles prior to pressurization and Third Stage start). The Prevalve was actuated shut and Recirculation system run prior to engine restarts to include the period preceding Trans Lunar Injection (TLI) burn. The Prevalve also provided a redundant propellant shutoff capability, supplemental to the main Oxidizer and Fuel valves on the J-2 engine. 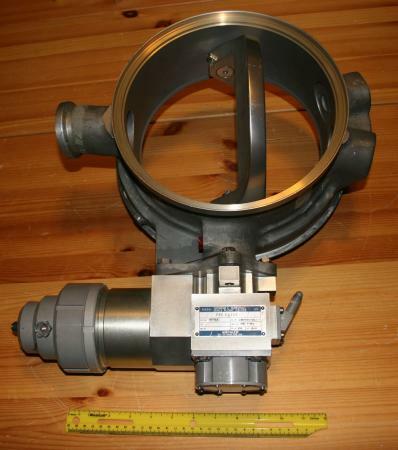 A similar Prevalve is used on the Saturn V Second Stage (S-II); an example is also featured within the collection.